In September 2014 Nolo Press Occidental surveyed a select group of customers to discover some of the most significant issues they faced while contemplating, or going through, a divorce. The survey revealed several problems divorcing couples have to overcome, and also things they most want to know about regarding divorce. Dealing with an uncooperative spouse was another big problem cited by the survey respondents. This included conflict resulting from things like alcoholism, domestic violence, child custody disagreements, refusal to negotiate, uncontrolled emotions, and personality disorders. Understanding the divorce process and what they should be doing now turned out to be another matter of strong concern. Most people don’t get divorced very often, and for many it was their first time, so they are treading unfamiliar territory and want to feel more confident about what to do and what is happening. One of the biggest problems noted by our survey takers was the slow court system, and the amount of time it was taking to complete their divorce. Many people said that their divorce seemed to drag on forever, with no end in sight, and they were anxious to get it over with and be able to move on with their life. The slow court system is especially problematic in California. In response to these survey results, we at Nolo Press Occidental are creating information products to address our customers’ major concerns around divorce. 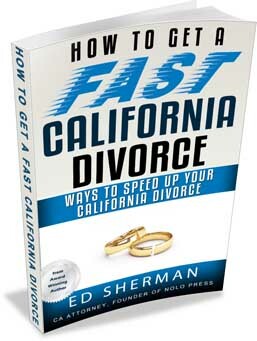 We have just released a new eBook, How to Get a Fast California Divorce, by attorney Ed Sherman, that outlines several things you can do to speed up your California divorce. One of these things is a not very well known but extremely effective strategy—hiring a private judge. We are now offering a free report on how you can do this, which is available for download by clicking here. We are currently working on a series of reports on divorce and money that will address the various financial concerns cited by our survey takers. And to help people better understand the divorce process, and what stage they are at in it, we explain the five major divorce profiles and provide helpful information on what you should do at each stage. This information is provided by attorney and award-winning author Ed Sherman. After more than 40 years of experience helping over 45,000 couples get divorced out of court, Ed has seen it all, and knows that almost any case will fall into one of these five profiles. Click here to access Ed’s explanation of the profiles and learn what actions to take for each profile.